Members of 99Rootz in California’s Central Valley. Credit: 99Rootz. All rights reserved. 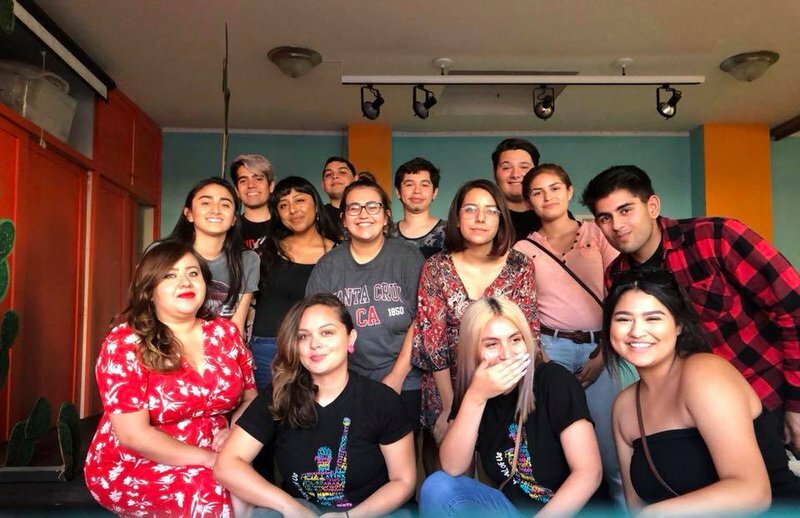 99Rootz is a regional youth and young adult leadership initiative specific to the Central Valley, and was launched in early 2018 by Mobilize the Immigrant Vote and YVote. MIV-YVote (soon to be Power California) harnesses the energy of California’s diverse majority to create a state that is fair, inclusive and just for everyone who calls California home. MIV-YVote builds the power of young, immigrant and refugee voters of color and their families to win policy victories, elect and hold leaders accountable, and meet the aspirations of their communities. As a youth organizing project rooted in social justice, 99Rootz builds leadership pathways and safe spaces for growth and development for young people in the towns that surround Route 99. Working out of two offices in Sanger and Merced, Alicia Olivarez, 99Rootz Strategy Director and Crisantema “Crissy” Gallardo, their Senior Organizer, know firsthand the joys and struggles that young people experience in the region. Alicia and Crissy were born and raised here, left to attend university at Harvard and UC Berkeley respectively, and then returned to their hometowns to help build a movement of young people of color who are transforming their communities. “In Atwater, I always felt like there was never anything to do. Public transportation was pretty much non-existent so getting around to the bigger towns was hard. Monday through Thursday my [farmworker] immigrant parents worked in the fields and on Sundays, their only day off, we would go to mass and then grocery shopping. That was our routine. My older siblings got involved with drugs and gangs and law enforcement was constantly at my house. My older sister was murdered when I was sixteen and my older brother was in jail at the time. That moment made me feel like I was the last child that could do something to make my parents proud. They worked really hard and their biggest dream was for one of us to make it to college. “My neighborhood [in Sanger] was made up of hard-working, largely immigrant, farm and packinghouse workers. This included my family who worked the surrounding fields. My parents could not be around for numerous reasons, including needing to work, so it fell on me as the oldest child to take care of my siblings. I did this as best as a child can take care of other children. Growing up all I could think about was how badly I wanted out of my reality, which included being accustomed to drive-by shootings, worrying about loved ones with meth addictions, and living in housing infested with roaches and mice. I just felt incredibly alone and hopeless. The scale of problems in the Central Valley creates a heightened sense of the absence of community safety and wellbeing. Elected officials and law enforcement maintain power by fabricating a performance of safety through excessive criminalization. True safety requires the inclusion of people who are the least engaged in decision making—especially youth and women of color, queer, and disabled folks—while also lifting up their power. 99Rootz is shifting the ways in which these communities are viewed and the ways in which they participate in the political spaces of the Central Valley by utilizing a combination of culture and organizing. They are helping residents to create a future where all people have a say in the decisions that affect their lives; power that truly rests with the people. This year, youth organizers at 99Rootz are campaigning for safe schools and communities. The 99Rootz office serves as a cultural hub for young people to experience and create art; a base from which to run phone banking and door knocking campaigns; and a resource for political education and voter registration. 99Rootz works to change this from the ground up by organizing to elect decision-makers who have a genuine knowledge and understanding of the communities in which they work. They are helping to train the next generation of leaders in the values and skills they will need to govern faithfully for all. As part of 99Rootz’ commitment to providing young people with the skills and resources they need to thrive they lead a “Freedom Summer” in partnership with the University of California campuses at Santa Cruz and Merced. In the footsteps of the 1964 Freedom Summer where young Black folks travelled to Mississippi to register as many Black people as they could to vote, 25 students from the Central Valley have come back to their hometowns as 99Rootz interns to organize young people in low-income communities and organize voter education and registration drives. They will also help to facilitate 99Rootz Summer Academies for young people of color. The academies include deep training on identity, political education, and campaign planning as well as a culture track through which young people can gain opportunities to create art and attend workshops that acknowledge collective trauma and create the space and trust to heal together. Crissy and Alicia’s vision is expansive, and rooted in love for community. “[99Rootz is] a pathway that amplifies the local talent and resources that already exist in our communities,” Says Crissy, “Young people in the Central Valley are powerful. We are proud to be Black and Brown, we are proud to be immigrants and refugees, and we are thriving. More freedom centers will open up across the valley and more young people of color are going to be in the forefront fighting for justice. I want 99Rootz to be the vehicle youth use to transform our schools, cities, and region. “I came back to the Valley because, although I was talking about social justice work and wanting to create change, I kept finding myself further and further away from those most impacted. By the time I got to Harvard, literally across the continent in one of the most concentrated institutions for power and privilege, I couldn’t lie to myself anymore. The model 99Rootz represents is important because it places power directly in the hands of young people from the Central Valley. They register other young people to vote in their high schools, talk to their peers on the phone, and walk in their own communities talking to their neighbors. What makes this work even more impactful is the integration of art and culture into organizing. 99Rootz recognizes that this movement is not whole until people start connecting to each other in new ways. When those in power want us to be quiet we scream louder. When they want us to be still we dance joyously with all our loved ones. 99Rootz is making space for the creativity and joy that comes from art and culture to surround organizing work and provide what people truly need to grow and imagine a different future. They are leading the way and showing us that it is possible to be woke, to dream, and to change the power structures of self and society all at the same time.